The rich, earthy hues of fall provide a nice transition from the light, lively rainbow of pastels that marks summertime and the imminent (ominous) cold — maybe wet and windy — gray winter. As the outside temperatures begin to drop, the deep yellows, russets, reds and maroons of the changing leaves provide warmth and brightness to this fleeting season. Before the leaves are all gone, take note of the rich kaleidoscope at all levels — trees, shrubs, and perennials — and consider adding some choice new plants to your landscape in the spring that can be enjoyed during falls to come. We all appreciate the fall colors of trees and shrubs that are most ubiquitous in landscapes — Dogwood, Sugar Maple, Burning Bush Euonymous. (In fact, the latter shrub is quite invasive and, frankly, does not provide much interest in other seasons). Here are some of my favorites for excellent fall color, recommended partly because they offer special interest during other seasons as well (e.g. pretty flowers or ornamental bark that stands out in the winter). Trees. Starting at the highest plane, there are many deciduous trees that provide a focal point for an area of the landscape and particularly stand out in autumn by displaying brilliant foliage, in addition to other attributes to grace various seasons, be it colorful flowers or bark. The Cornus kousa (Chinese Dogwood) offers lovely white flowers in early summer, and beautiful exfoliating bark in a mixture of cream and gray splotches. The large berries provide color in September before the fall foliage in red or purple hues. Resistant to disease that plagues other Dogwoods, the Kousa provides outstanding 4-season interest in a small flowering tree. 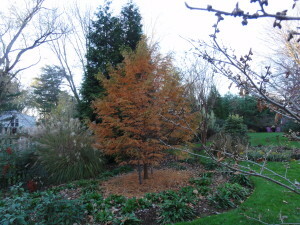 The Metasequoia glyptostroboides (Dawn Redwood) is a larger specimen that, while a deciduous conifer, is very ornamental in winter by virtue of its reddish brown exfoliating bark that stands out in the winter landscape. 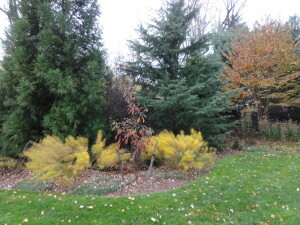 The orangish- to reddish-brown needles in fall appear to be on fire, and then settle nicely at the base of the tree to provide mulch and colorful interest into the winter. 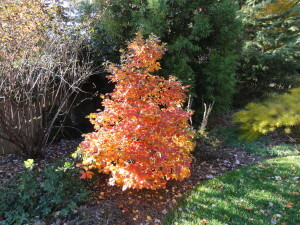 Acer griseum (Paperbark Maple) is another small tree, ideal as a picturesque specimen close to the front of the house, providing interest in all seasons. 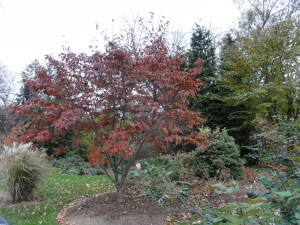 True to its common name, this maple produces striking copper-red bark that exfoliates dramatically (like peeling paper). 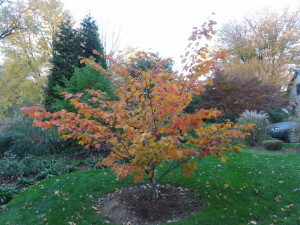 The rich bark stands out when the tree produces its outstanding red leaf color and during the summer with the delicate foliage that covers a shapely, graceful tree habit. 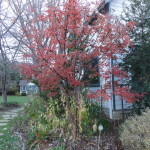 There are numerous Malus (Crabapple) species that provide stunning red to orange fall foliage, as well as ornamental fruit, outstanding floral displays in summer, and ornamental peeling bark through the year. 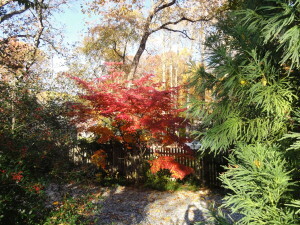 There are many maples that provide year round interest in addition to outstanding fall color. 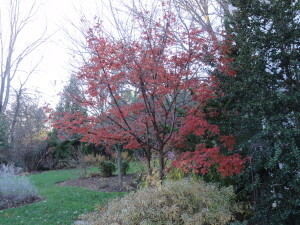 The Acer japonicum ‘Aconitifolium’ (Fullmoon maple) — just 8-10 feet in stature, can fit easily most anywhere. This and other maples sport foliage that turns a brilliant array of intense colors in fall — from red-brown, to striking red, to brilliant scarlet to purple. Shrubs. Shrubs fill in the important middle layer, and there are outstanding choices to use in groupings or as specimens. 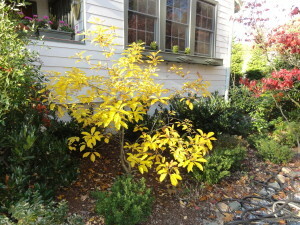 Some of the most colorful for fall foliage are: (1) Chionanthus virginicus (White Fringetree), a native multi-stemmed small tree or large shrub that glows a vivid yellow in the fall; (2) Hamamelis x intermedia (a hybrid Witchhazel) with varieties producing winter flowers in yellow, copper or red, after an outstanding fall foliage display in orange and red; and (3) Fothergilla gardenii (Dwarf Fothergilla), a nicely compact native shrub with leaves that glow brilliantly for several weeks in the fall, capping off multi-season interest by its rich corrugated summer leaves and prolific ‘bottle-brush’ white flowers in early summer. Perennials. There are many perennials that provide interest into the fall — primarily with late year blossoms. 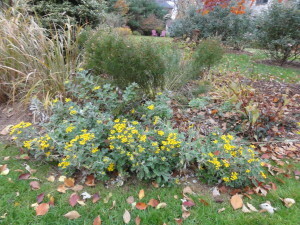 One of the latest flowering perennials is Ajania pacifica (Gold-and-Silver Chrysanthemum) that flowers through November. While its foliage does not produce fall color, this perennial provides interest from spring through fall (and often through winter) with attractive variegated foliage (stem and underleaf is bright white/silver), and leaf edge is white/silver). An outstanding perennial for fall foliage is the Amsonia hubrichtii (Arkansas Bluestar), a large, nearly shrub-sized perennial that glows a brilliant golden yellow well into fall. This plant is also a star in spring when it displays panicles of tiny sky-blue flowers (‘blue-star’), and through the summer its soft willow-like mid-green leaves, reminiscent of asparagus fern, provide an excellent contrast to surrounding broadleaf plants.